While Jamaican universities are graduating students who are theoretically brilliant, many young graduates lack the requisite skills of networking and socialising which are needed to succeed in any industry across the world — according to Mayple Dorrington, Toronto-based strategist and banking specialist. Dorrington, a graduate of Mona School of Business and Management (MSBM), who has worked in the financial sector for more than 30 years and in 27 countries across the world, was speaking at a professional development session which she conceptualised under the theme 'Networking With A Purpose' —exclusively for MSBM alumni as part of the institution's strategy to encourage lifelong learning, including personal and professional development, among its graduates. 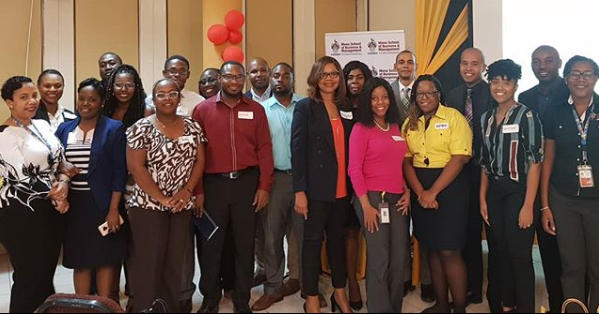 The session, which was hosted by the MSBM Alumni Association at The University of the West Indies earlier this month, saw participants receiving training in networking to attract, develop and maintain mutually beneficial relationships. The professional development session examined the key characteristics of networking including how to make an impact in the first five seconds of meeting someone and how it should move into forming relationships. Dr Shaun Barrett, MSBM MBA alumnus and lecturer of business and information technology at the University of Technology, had high commendations for the content presented as well as the presenter. “The session and the presentation were very practical and informative, and I love that the content presented can be implemented immediately. I currently teach a course on personal development at UTECH which includes networking, and it's refreshing to see that the information presented is in line with what I have been teaching my students,” she said.